Thread: What kind of drum kit is this? I want to buy it. Yes, I know it's a Pearl, but specifically what kind of Pearl? It comes with 2 snares, 3 symbols, ride, hihat, 4 toms, one bass drum (double kick), & it looks like new. It is much bigger in person. I might offer $4000, is this too much? Too little? It sounds great, no scratches except for one minor one on the bass drum. Re: What kind of drum kit is this? Welcome to Drum Chat icedgreece! Can you get us a picture of the badge? The color reminds me of a Sessions kit, but then, I am no expert on Pearl kits. I am sure there are others that can help you more than I can. I'm with PB...I have never seen that finish on any kit except Pearl Sessions. I know Sessions were higher mid-level kits but I don't know how much it would be worth. 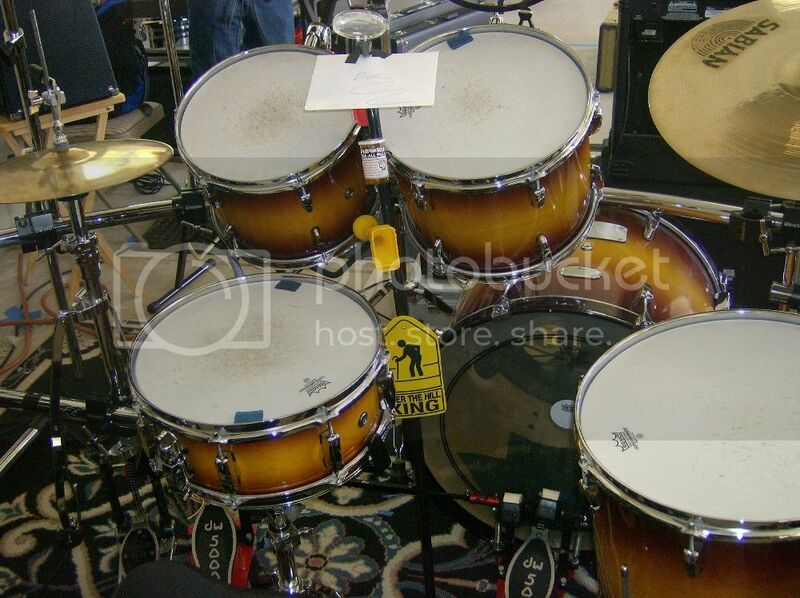 Looks like Pearl Reference drums....but as others have said.. a pic of the badge will clear that up. Welcome to DrumChat! Good luck on the future purchase...looks really cool. Hey guys. Thanks for all the welcomes! So, I asked the seller (a good friend), and he said it's a Pearl Session Custom. (maple). So, anybody have any ideas on what it's really worth? $4000 seems like an awful lot for that kit used. That's almost retail price for what is pictured there. I can understand not wanting to short change your friend. At the same time though, you have to watch out for number one. For around $500 more than what you're offering you could easily get a brand new kit loaded with manufacturer's warranties. Without knowing exactly what the 2nd snare and what the cymbals are, I'd say offer no more that $3000 - $3100 for that complete set. In my honest opinion, that's a fair price that kit. Shells on their own are worth about $600, rack about $150. The ride looks like it has a big bent and crack in it, so its worth nothing. Cant really see the crashes and hats so I'll just guess and say $200. The pedal $150 and the second snare well even the best used snares on the market rarerly top $300. So add that up and tops I would offer is $1300 thats Canadian dollars. That's a Pearl SMX. Nowhere near worth $4000, when they were out(they are cancelled now) they retailed around $1000-$1500. You see, when you try to resell things they just aren't worth more than half of retail- people who ask that much are looking to screw someone and should be avoided. I'd give him $2000 max, but aim for much less than that, considering resale values on all of the items. Nice kit it should be worth at least 1500. He sure uses alot of duct tape on top and bottom heads wonder why? I agree with NR, this kit is nowhere close to 4 grand. Used sessions arent too expensive. I'd say around 1400 or so, depends on what the other cymbals are. My used Pearl SBX (birch) shell pack cost me $799. Included matching snare (5.5x14") 12" 13" rack toms and a 16x16 floor tom. Right on Dave. And as others have said, they aren't worth that much...I would say between 1-2K max. Great drums though, I've had mine since 2007...and Green Burst was my favorite finish for the SMX line.